My respect and admiration for wildlife photographers has increased exponentially in my quest to get a picture of the Wren who has built her nest on my front porch. I have tried several approaches to catching a picture of her tucked in her nest but with no success. Until today, that is! With the onset of wind and cold temperatures the past few days I think she was more than ready to seek shelter at dusk this Sunday evening. We have all been surprised by the sudden weather changes but at least the wind has taken care of the pollen problem to some extent and we didn’t get a blizzard like the northeast. Am I the only one trying to figure out what a “bomb cyclone” is? Where did these exaggerated terms come from? Can we dial it back a bit? Excuse me, I digress a bit! Back to Wren…I opened the door to take out the trash and at first I didn’t notice her. I wasn’t even tiptoeing or gently closing the screen door trying not to scare her. I didn’t expect her to be there and she didn’t fly away! We momentarily stared at each other and I quickly kept going hoping she would stay there. Of course, I didn’t have my cell phone with me to take her picture. After a minute of pacing in front of the garage plotting my next move, I decided to risk opening the garage door and hope the squeaks it makes wouldn’t scare her away. I got my cell phone and tiptoed toward the porch to take her picture. I think she was too cold to think of leaving her nest or maybe she is already warming her eggs but I was able to get these few pictures. Look closely! There is her eye and beak! I know it isn’t much but I feel it was a success! I didn’t want to disturb her anymore so I went back inside via the garage. Next time I am breaking out my 35 mm with the zoom lens in hopes of a better shot. I think my photographer Dad, God rest his soul, would be mildly proud of my amateur efforts to capture a bit of nature on my doorstep. A week ago the beginnings of a nest were started outside my front door. Then I went away to visit two of my four grandchildren in the upstate. When I returned yesterday this is the completed nest I beheld and wondered what little bird has come to make her home on my front porch? Spring has unofficially sprung in the south and I am happy to host this tiny occupant for as long as she wants to stay. I mentioned to my husband that I wonder if we will ever get to see our house guest as the opening of the front door naturally scares her away. This morning, shortly after the break of dawn, I quietly opened the door and I got a quick glimpse of a tiny brown blur that flitted from her nest to the nearby red maple by the porch. As she perched on a twig I had just enough time to determine if she was a sparrow or a wren. I wasn’t sure but took a mental picture in my mind’s eye. Later, I verified that she is indeed a wren…a tiny bird known for its great song. I may never get to take her picture or hear her song but I know she will be nearby especially when she lays her eggs. I am certain tiny wren with a great song is unaware of the metaphor she has brought to my attention but like all beautiful mysteries, I won’t ask why and will simply enjoy her presence with a grateful heart. The house that wren built will soon unfold the fertile mystery of new life and her song of motherhood will join the choir of birds welcoming Spring, birth, and rebirth! I will continue to visit this powerful metaphor during this season of Lent and may even get that picture of tiny wren in her house one morning. If the neighbors see me sneaking around in my bathrobe trying to take her picture, I hope they won’t call the police! Sometimes I am swept off my feet by metaphors, powerful images in words that convey a deeper meaning and leave indelible marks in my soul. Today while reading The Ragamuffin Gospel by Brennan Manning I was hit like a bolt of lightning with this one: I could more easily contain Niagara Falls in a tea cup than I can comprehend the wild, uncontainable love of God. I closed my eyes to imagine this idea and tried to make a mental picture of Niagara Falls pouring into a tea cup held in my hand. Well, of course I would be unable to even stand in the presence of such a force of nature and would likely drop the tea cup in the process. When I opened my eyes I wanted to see if I could capture the metaphor in a photo. Hence, the image above. Under the shimmering blue cloth (water) is a photo of a painting entitled The Gift by Pedro Rodriguez and it depicts the Christ Child offered in the hand of God, the gift of God’s Love. The tea cup (the vessel, the self) holds a beaded angel made from safety pins and clear beads. 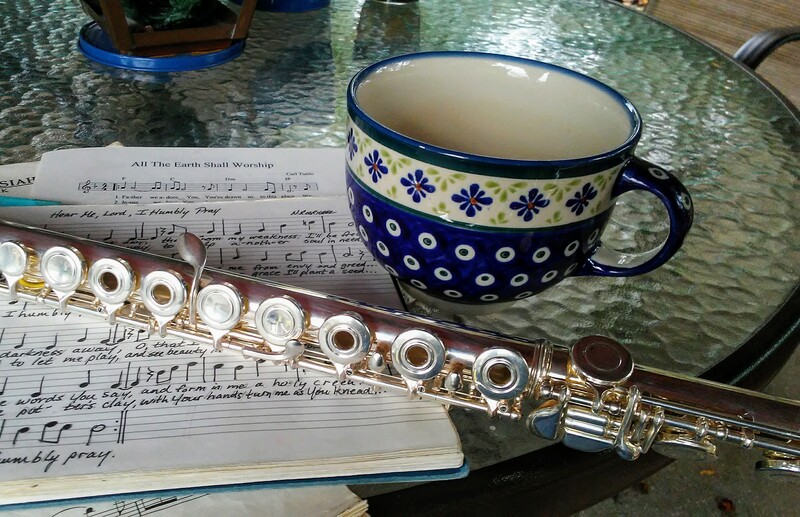 It was given to me by my neighbor many years ago who wanted to thank me for the gift of my flute music which I sometimes played sitting in the backyard marsh. I don’t pretend to be that angel but only hope to be a vessel for God’s Love to shine through in spite of my weaknesses, sins, and brokenness. Perhaps angels really are made of safety pins (to help hold us together) and clear beads (purification). I fall, flail, and fail daily but it sure helps to know God’s Love for me (and you) is more uncontainable than Niagara Falls in a tea cup! Happy New and Renew Year! I love the fresh promise of a new year, untouched and crisp like frost on the grass, where the hope of dreams new and renewed may be realized as the sun rises and warms the frozen earth. I hope this is the year that my dreams frozen like seeds under years of frost will melt and rise up to inspire creativity to flow again. I want to believe in my dreams, new ones and renewed ones, to love them and hold them close in my heart like I once held my babies. The babies grew up and went out into the world but the seed dreams have not yet matured and been let go to live and grow on their own. Perhaps this season of seed dreams unthawing in the warm sunlight will be the one where they will be resurrected to grow strong and tall, blooming in radiant colors and glorifying God by becoming what was meant to be. There is much to do before the seasons change and inevitable winter comes once more to put my seed dreams to sleep. I have learned some lessons to help them reach maturity but those lessons are fodder for another day. This pen and ink drawing, “Resurrection,” is from a decade when creativity was flowing intermittently in the midst of life with three school age children and a pet menagerie running me ragged. Quiet moments for art were hard to find but once in awhile I managed some time away to draw, to write, to play the flute. The hope and promise of “Resurrection” is that dreams like prayers can rise up and be set free in the ethereal realm. Do you have a dream frozen in time? Remember it, love it, open the window shades in your soul and let the light in to warm it, revive it, and breathe new life into it! Sometimes we have to get the blood flowing with vigorous soul rubbings to avoid frostbite and it is vital to get up and get moving! The creative juices will flow again and inspire new and renewed dreams. Then let your dreams go when they are ready to shine in the light of God’s Love. It has been a long time since posting in this blog. My life has been rather full of unexpected occurrences and my time has been occupied with bittersweet changes. Stress has been a familiar companion (though unwelcomed) and I have found myself relying on tried and true tools for coping that have worked well for me throughout many seasons of change. When I worked as an art therapist, I often used the metaphor of “tools in my tool bag” for helping clients identify healthy coping skills to deal with stress, anxiety, and depression. Each person is unique and the tools or methods one develops to become healthier will most likely reflect varied interests, skills, talents, and personality traits. It is important to discover those tools and carry them with you in a metaphorical toolbag that represents your life journey. The image shown above depicts some of the tools in my tool bag helping me recently to cope and to grow in trying times. Playing the flute helps me tremendously because of the breathing involved and the state of relaxation required to bring forth a good tone in the music I play. Sometimes a song is inspired and I try to bring it to life by writing it down. When I play it is always helpful to have a cup of coffee nearby and especially in a favorite blue cup that lifts my spirit along with the music and the caffeine. Sometimes the music that helps me the most is to play favorite hymns and pray as I play. It has been several months since I sat in these chairs in our backyard on Turkey Creek. These wooden, adirondack chairs have long been our vantage point to the natural world and a reflection place for the soul, comparable to the healing sought on the proverbial therapist’s couch. On the edge of this serene marsh growth and renewal take place. As the tides ebb and flow daily so have emotions, depending on the daily struggle to ponder or the joyful event to celebrate. As a result, many words have flowed from my pen to the pages of my journals through the nearly two decades of life here. I watched our children grow up, prayed for their well being and gave thanks for countless blessings, including welcoming grandchildren into the world. I grieved the deaths of my parents and worked on many issues, seeking solace and shelter from life’s storms. Likewise, laughter from joyful hearts soared with the hawks and eagles above the fray. Thirty years of marriage recently celebrated have also been the focus in these chairs which have served as a crucible for the last eighteen years where loving and suffering stirred in a bittersweet mixture of joy and pain. Thankfully, our love rises to the surface and keeps heart connections growing stronger and deeper, no matter the grief or turmoil that has befallen souls in a sometimes dark world. The beauty of this place is cherished and respected but it has its problems due to tidal changes and floods. This reality hit home last fall when South Carolina experienced the worst flooding in centuries, donned the 1000 Year Flood. Water filled these empty chairs for five days, as well as the property and street. I was grateful that our home stayed dry even though the studio garage and crawl space under the house did not. Around the state we were at the mercy of mother nature and it brought back memories of surviving Hurricane Hugo in 1989. Flood water was not the issue for us then nor did we have to leave our home permanently. However, the anxiety and fear was high as I was nine months pregnant and we considered my water breaking in the path of a hurricane as a good reason to evacuate. Living in the aftermath of childbirth or a natural disaster leaves indelible marks in the memory no matter the time that has passed. Great nuisances of daily life in the aftermath of either event are seen through the lens of gratitude for life sustained and protected from utter destruction, teaching lessons in not sweating the small stuff. Nevertheless, in the physical world of our current home, the tides get higher and chronic moisture issues affect the long-term health and safety of living here. The future is yet unknown but the possibility of letting go of the home we love and moving to a new home is a bittersweet change to consider. Over the last few months the thought of sitting in the once reassuring laps of the chairs increased anxiety not lessened it, making them truly empty. I avoided them because the memories of the flood were too recent and time needed to pass for their healing effects to override the fear. Also, I’ve been very busy otherwise making it easy to do so. Recently, I sat in them for the first time since they were drenched in water and I was “flooded” with good memories from better days, the days when children’s laughter filled the air. In spite of becoming wobbly and more fragile from fluctuating tides and temperatures, the chairs still hold these happy memories. They may be too weak to survive a move, bringing their function and purpose into question. Either they will need to be fixed or new chairs may have to replace them from a different vantage point where concepts like “place,” “home,” and “purpose,” can be contemplated and redefined anew. Given what I have lived through so far, God has always provided and He will now. Change is a fact of life and the more it can be embraced with open arms, the better it will be. God’s grace and mercy will keep us in the shelter of His love.